Messy Monsters Classes will be on Tuesday, 10-11am at Popley fields in Basingstoke. Sessions start Tuesday 8th September. You can find more details at the Messy Monsters Facebook page. Don’t miss out on future posts like this – you can receive updates directly to your inbox by email by adding your email address to the box on the top right of this page and hitting subscribe. You can also follow NorthHantsMum onTwitter, Google+, Facebook Page, Facebook Profile, LinkedIn and Feedly. I hope to see you there! INTRODUCING TOTS PLAY – Every Class Your Child Needs In One!! Spaces still available for all 3 classes, all FREE of charge on Launch Day with discounts available if you go on to sign up for the rest of the term. 9:40am – Social Tots – from 8 months to 3 years – a wide range of physical, musical, sensory and social play activities for older babies and toddlers. 10:30am – Discovery Tots – from 8 weeks to around 8 months – Stimulate, delight and boost the development of all baby’s senses at this fun, interactive class with yoga based movement, music, sensory play, sign language and more. 11:20am – How to play with your new baby Workshop – for expectant and new parents of babies up to 6 months, this is a taster of the 6 week Baby Development Course starting on June 8th which teaches you fun ways to play, interact and communicate with your new baby, including massage, yoga, sign language and more. Please get in touch for more information or to book your place, and feel free to share this post with any friends you think may be interested in Tots Play. Relax Baby is a 6 week course which has been created with a range of activities to stimulate and calm your baby whilst supporting their natural development. Sessions have been designed by Psychologists, Teachers and Therapists to help encourage your baby’s confidence and awareness along with their cognitive, communicative, social, emotional and physical development. These classes will also allow for a fantastic space for parent and baby to connect and enjoy being with each other – it’s never too early to be introduced to calmness and contentment! We recognise how much new parents want to help their little ones be calm and happy, we also know that it’s equally (if not more) important for parents to have a sense of space and to feel calm too – Relax Baby classes aim to provide for both your needs – helping you feel more calm and relaxed while you bond with your baby and support their development. 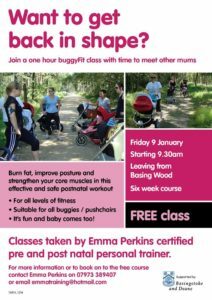 This fun and interactive classes will incorporate our unique 7 step approach and include movement, play, gentle stretching, gentle baby touch, breathing exercises for parents, affirmations and visualisations / relaxation. Each week will follow a theme based around a nursery rhyme, we will use 3 nursery rhymes during each 6 week course and we will visit each one twice. In total there are 6 nursery rhymes which will allow for 2 courses to run, so those who have attended the first course can go on and attend a second which will have different nursery rhymes. The thinking behind this is that babies love repetition – that’s how they learn, and repetition starts to build their confidence. And we want you to relax into the sessions and enjoy! Classes will help you feel more calm and in control while you bond with your baby. 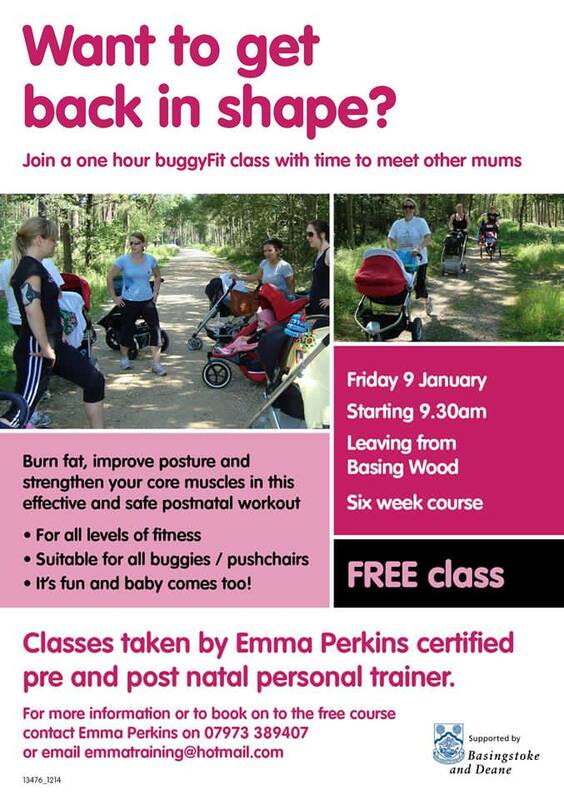 I am so gutted I never got the chance to do a Buggyfit class, as I didn’t find out about them until after Miss NHM was too big. A great way to kick off your fitness resolutions for 2015! 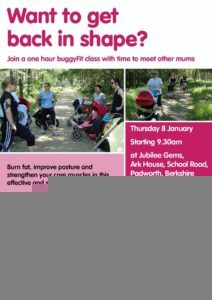 Free Buggy Workout class in January! I’m Katie and I run Cookery Doodle Doo from my home in Laverstoke, North Hampshire. At Cookery Doodle Doo, we run relaxed and fun cooking sessions for pre-schoolers every term-time Wednesday and Friday morning. Using great-quality ingredients, we bake something new each week and also do fab craft activities and read stories whilst our creations are in the oven. Even fussy eaters love Cookery Doodle Doo as the focus is on the activity, although children are encouraged to try new flavours in a supportive and unpressured environment. Sometimes it’s sweet, sometimes it’s savoury but whatever we cook, your kids are learning a vital life-skill… and in the meantime you can chat with other parents and have a coffee. We do all the prep, cleaning and washing up for you; all you have to do is take home a happy child and your parcel of goodies. We also offer our popular Cookie Art decorating parties, run seasonal ‘no cook’ cookery sessions for nurseries and preschools, and have just launched our sell-out monthly Sunday Morning Pudding Club for children aged 5-10, helping them to produce the dessert for your family Sunday meal whilst you relax at home with the papers. What a great start to a Sunday for the whole family! or contact me at katie.black@cookerydoodledoo.com or 07473 958402. 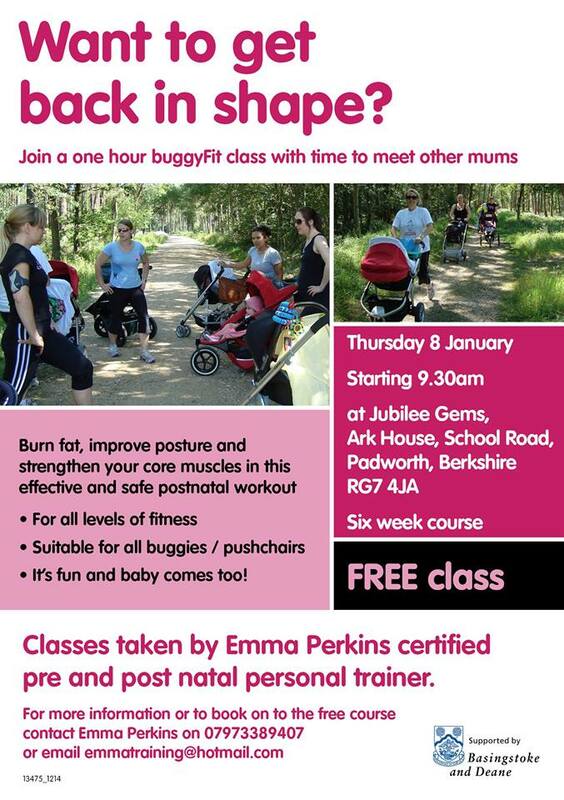 This looks like an absolutely brilliant new class for babies and toddlers! Wild Child is a new baby and toddler session which encourages an enjoyment of outdoor play and nature. The sessions will be lead by Angela, a trained Ecologist and mum of two. Each session will begin and end at Sherfield Village Main Hall (RG27 0EZ) and will involve some outdoor fun on the village green. There will be games, songs, stories and much more. Sessions will run Monday mornings 10-11am from October 6th. Come dressed for the outdoors. Tea/coffee/(and towels!) will be provided. The introductory price for the Autumn term is £4.50 per child, per session, pay as you go (normal session price will be £6 PAYG or £4.50 pay per term). Booking is advised but not essential. The sessions will be suitable for 6 month – 5 year olds (all children must be accompanied). For more information see the facebook page: https://www.facebook.com/wildchildtoddlers or call Angela on 07812350925. Tot Cross Buns is a brand new cookery class for children aged from 2 years old to preschool. I’m Allison, the face behind Tot Cross Buns. My childhood memories consist of having great fun in the kitchen with my Dad, concocting all sorts of recipes and making a mess! This gave me confidence with cooking and I have never been afraid to try new foods or add my own twist to a recipe. I love cooking in the kitchen with my little girl and she loves being involved every step of the way! I believe every little person should have fun cooking, tasting and exploring food, having the confidence to try new things. The aim of the class is to introduce children to food through taste, smell and touch, whilst having fun and enjoying themselves. It is also a great way to spend some quality time with Mum, Dad or Grandparents! We cook a wide range of recipes from muffins and scones to pizza, quiche and lots more. We also have a fun activity whilst our goodies are baking. Activities can include food exploring and tasting, food related games and we also get creative! Classes are relaxed and friendly, with just 6 children per class! My classes are run as a 5 week course and last 45 minutes per session – although I would ask that you allow an hour. I am currently able to offer classes on a Tuesday and Thursday afternoon starting at 2.00pm and I also run a class on a Friday morning at 10.00am. The venue is Cross House in Bramley. I am also hoping to offer other venues in the near future. I am CRB/DBS checked, with a food hygiene certificate and first aid qualification. If you would like to come and join us or for more information, please contact me via Facebook: https://www.facebook.com/totcrossbuns, the website or your can always email me at totcrossbuns@gmail.com. Hi, I’m Kath and have recently qualified as a Relax Kids Coach and am just setting up in Basingstoke and NorthHantsMum kindly offered to give me some space in her weekly blog to promote the sessions I’m running. We are all guilty, I’m sure, of rushing from one appointment to the next; from breakfast to school; from school to after school playdate; from dinner to bath to bed … you get the picture. We just don’t build in time to relax anymore, particularly as there is so much around us to distract us – tv, ipad, playstation – the list is endless. A Relax Kids class follows 7 steps – dance, games, stretches, massage, breathing exercises, affirmations (positive statements) and visualisations. So in a nutshell, taking children from high energy games (eg stamping and shouting like angry giants) to relaxing on the floor (and listening to stories). I love the whole concept of Relax Kids and when I did the course I did wonder whether it would be possible in a room of 4 year olds to take them from high energy games to relaxing on the floor and it was pretty amazing when I did my first class and it happened! I will be running two separate classes – 3-4 years (preschool age) – where parents will need to stay and find their own inner child as I’d like adult participation!!! and 4-6 (infant school age) where you can leave your child for the hour. I will be running sessions at The Studio in Dummer during the summer holidays. Places can be booked here: bookwhen.com/rkbasingstoke and cost £4 for an hour long class for school age children (4-6) or £3 for a 45 minute class for preschool age children (3-4). I can also be contacted via email (rkbasingstoke@yahoo.co.uk) for further queries.